William Ashford was the leading landscape painter working in Ireland in the late 18th Century. He was born in Birmingham and moved to Ireland aged eighteen where he was to remain for some sixty years. When he arrived in Ireland Ashford appears to have been untrained as an artist. He started exhibiting at the Society of Artists in Dublin in 1767, but as a flower painter. In 1770 and 1771 he exhibited pictures of fruit and game, and it was not until 1772 that he was first heard of as a landscape painter, an art in which he had already become extremely competent by the late 1770s. 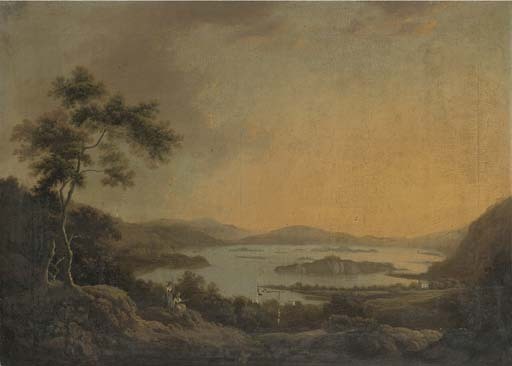 He painted landscapes all over Ireland and Anne Crookshank records several other Killarney views by Ashford which are variously dated 1778 and 1779 (A. Crookshank, 'A Life devoted to Landscape Painting: William Ashford', Irish Arts Review Yearbook, vol. 11, 1995, p. 125, nos 9-12).